I picked up some pork tenderloin at the store the other day. Mostly, at my local market, when you buy pork, you have to buy a package that contains 2 tenderloins, usually weighing in at over a pound a piece. One is plenty for a meal for 2-3. I made a delicious stroganoff with 1 of the tenderloins and provided the recipe in my last post. But, I still had another whole tenderloin and wanted to use it instead of freezing it for later. I stood in front of the refrigerator hoping for inspiration. I had a fridge full of pork, including the tenderloin, some pasture raised ground pork from a local producer and some thick cut, nitrate free bacon from Trader Joes. It was like a pig exploded in my refrigerator, and so I give you Pork Explosion, a delicious rolled pork banquet. I was quite surprised at how well this turned out. The combination of the tender Pork Tenderloin, crispy bacon, and savory fatty ground pork stuffing was perfect. 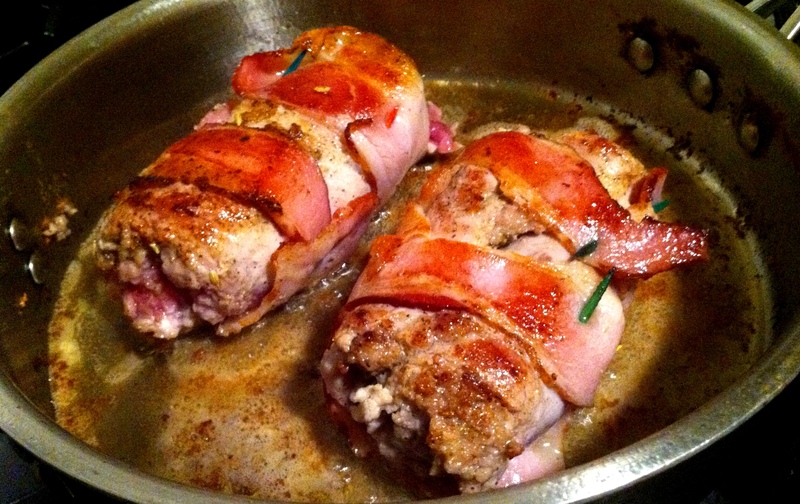 The fat from the ground pork made the interior of this rolled tenderloin moist and delicious. Served with brussel sprouts cooked in the left over bacon and pork fat made a delicious accompaniment. I think you will really like this too! Preheat your oven to 400º. Take the pork tenderloin and make a slice about half way through down the center of the tenderloin and spread it out on a cutting board or work surface. I cut the whole tenderloin in half, but I think it will work better if you leave it whole. Cover the tenderloin in plastic wrap and pound out the tenderloin away from the center in both directions until its about 1/2″ thick and uniform. Salt and pepper to taste both sides of the flattened tenderloin. Spread the ground pork over the entire surface of the tenderloin. Season the ground pork with salt and pepper and sprinkle the sage and fennel seeds over the surface of the ground pork. Now roll the tenderloin all the way until it once again resembles its original shape. 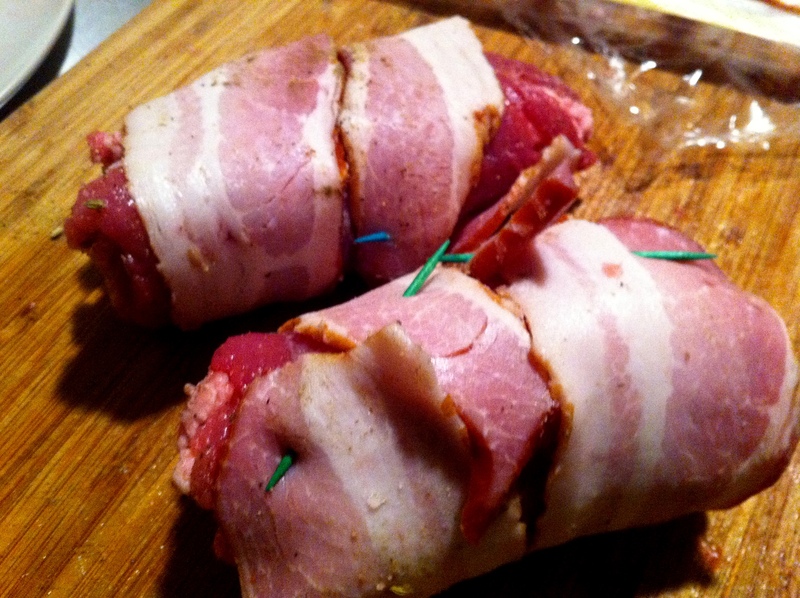 Roll the tenderloin in bacon to cover the entire surface of the roast. Secure the rolled roast with skewers or tooth picks if necessary. Now, preheat a large skillet over medium high heat and add the olive oil and butter. Saute the roast on all sides until the bacon is browned and crispy. remove from the skillet and place in a baking dish. Roast the stuffed tenderloin in the oven for another 15-25 minutes to the desired doneness, or when it reaches about 145-155º in the center. Take out of the oven and let rest for about 10 minutes before serving. Saute brussel sprouts or any other vegetable you have laying around in the fat from the pan that you browned the roast in. After the roast has rested slice it in about 1″-1 1/2″ pieces and serve with the sauteed vegetables. Well, wouldn’t ya know I just bought a huge pork tenderloin! Looks awesome! Okay, I’ve done the bacon explosion (several ways) but this is over the top! I’ll be making the Pork Explosion is the (very) near future! FYI…if you like roasting pork on a larger scale…La Caja China and I have (finally) released our first cookbook, “La Caja China Cooking.” Lots of traditional Cuban recipes, as well as Southern US favorites, and a few from around the world! Dude, you had me at “Pork Explosion”. Best. Name. For a recipe. Eva. Reinaldo – I just dont think you have made brussel sprouts the right way – I was a brussel sprout hater too until i started cooking them until really nicely browned in bacon fat with chunks of crispy bacon – wow there so good!